Impressive Emergency Landing of a Chinook CH 47-D, With a Missing Landing Gear! What happens when a Chinook loses a landing gear? Swift and efficient action is required by the ground crew to safely land the helicopter. Watch as United States Army troops at the base in Kuwait flawlessly execute a missing aft landing gear emergency procedure. In this video from December 2004, the pilot of a Boeing CH47-D Chinook helicopter skillfully keeps the Chinook level while troops on the ground masterfully construct a makeshift pylon of planks and a tyre to land the helicopter as safely as possible. The Chinook needs little introduction. The iconic Boeing tandem-rotor, heavy-lift helicopter has been in service for the United States Army since the 1960s, and the model displayed in this video, the CH47-D, remains in current use until a scheduled upgrade to the CH47-F in the next few years. The Chinook has supported military and humanitarian operations consistently over the last 50 years, with operators around the globe, including the United States, Japan, the United Kingdom, Australia and Iran, employing the Chinook as a supply and rescue helicopter of choice. Chinooks were utilized extensively in the Vietnam War to supply the United States war effort and a portion of the Chinook fleet became renowned for evacuating high numbers of casualties. 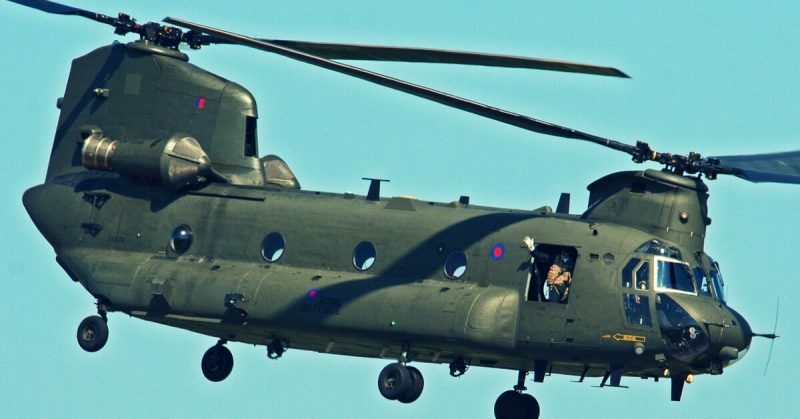 The versatility of the Chinook to land and take off from complex terrain and retain flight at high altitudes and low temperatures have made it the carrier of choice for geographically demanding recent conflict zones such as Afghanistan. While primarily employed for troop movement, artillery replacement, and battlefield resupply, the arrival of Chinooks is often also a welcome sight in its capacity to provide humanitarian relief. Chinooks were used to distribute disaster relief following the 2004 Asian Tsunami and the 2005 Kashmir Earthquake. With an incredible ability to carry heavy and large underslung loads, the Chinook’s versatility has made it invaluable for combatting bushfires, retrieving aircraft and even assisting with large-scale construction. The versatility of the Chinook to land on almost any terrain is matched by the skill and initiative of the crews who operate these workhorse helicopters, as displayed in this video of a smoothly implemented emergency procedure to safely land a damaged Chinook.